Chicago Mayor Rahm Emanuel responds to a question during a news conference last month about new police procedures. 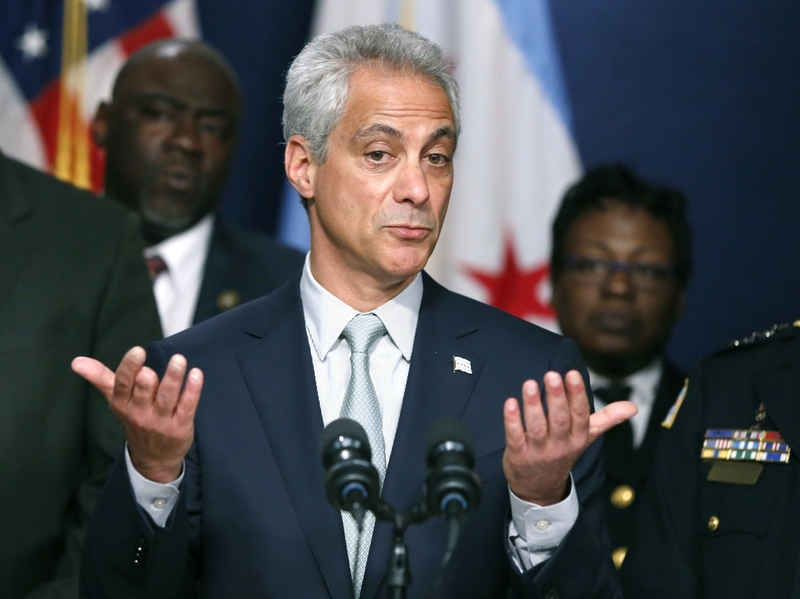 In Chicago, Mayor Rahm Emanuel has been fending off increasing calls for his resignation. There's also an effort underway to develop a recall law that would allow voters to replace Emanuel before the next election. "On the defensive" was not a phrase often associated with Emanuel, but that has changed since the city released a video of the fatal police shooting of 17-year-old Laquan McDonald. There have been protests in Chicago for weeks. Demonstrators have gathered downtown and even in front of the mayor's house. The protests began after a judge ordered the city to release a 2014 dash cam video showing a Chicago police officer shooting at McDonald, hitting him 16 times and killing him. The teenager was holding a knife at the time, but was walking away from police. Demonstrators, including 16-year-old Lamon Reccord, say Emanuel withheld the video until after he was re-elected in November — a charge the mayor denies. Reccord says Emanuel badly mishandled the McDonald case. recent protest. "We need you to step down." Chicago Sun-Times columnist Laura Washington, who has worked in city politics and media for 30 years, says the outcry is like nothing she's seen before — "It's broad-based, it's intense and it doesn't seem to be going away." But the mayor's seeming vulnerability may not matter, Washington says, because nobody seems to be lobbying to take over his job. "I've talked to a lot of people...who don't like Rahm, who think he's failed the city in many ways — but who say he's the best we've got right now. And they're afraid of what the alternative might be," she says. And Emanuel has no intention of stepping aside. He recently told reporters that he's working every day to rebuild the public's trust in him. "First of all, my actions will be a piece of that. My words and the follow-through on my words to make sure those actions are essential," he said. "And the primary work is to make sure that when it relates to public safety that there's trust between the community and our police department." Any vacancy in the mayor's office before the next election, three years from now, would mean Chicago aldermen would elect one of their own to fill the spot— but most city aldermen largely march in lockstep with the mayor. But Illinois State Rep. La Shawn Ford, a Democrat, is working to develop a recall measure, supported by Gov. Bruce Rauner, a Republican. "I don't think voters in a democracy should have to wait for the next election or be stuck with an elected official that they don't want," Ford says. The bill is unlikely to go far — few Democrats here back it, and it would need the support of two Chicago aldermen — but support for Emanuel is dwindling, especially among African-Americans upset about record school closings and police shootings. Emanuel is racing to repair that damage — forcing the resignation of the police superintendent, initiating police reforms and touting the expansion of job training for ex-offenders at a press conference this week. "I think he's working at it," said Davis. "He's going places that perhaps he didn't go, talking to people that he didn't talk with." Davis says that will serve the mayor well, but might not change the angry mood in Chicago. On the city's west side the day after Christmas, police shot and killed a 19-year-old man they described as combative. But in the incident police also accidentally shot and killed the man's neighbor, 55-year-old Bettie Jones. At Jones' funeral this week, the family thanked Mayor Emanuel and other dignitaries for their support — but as people left the church, a prayer turned into a protest, with a chant blasting the Chicago Police Department. For Chicago and its mayor, it's a troubling time.